Westchester Medical Center Health Network recently performed the 200th heart transplant at its WMCHealth Heart and Vascular Institute. Three of those patients share their stories. Heart disease is the leading cause of death in the United States, killing 335,002 men and 298,840 women in 2015, according to the Centers for Disease Control and Prevention. That’s 1 in every 4 deaths. Westchester Medical Center’s heart failure program offers the latest care for congestive heart failure treatments, including tailored therapy, investigational medications, surgical procedures, mechanical support and heart transplants. Nearly 10,000 New Yorkers are on a nationwide waiting list of more than 118,000 people who need an organ transplant. An average of 22 people die each day in the United States from causes that could have been treated with a donated organ. Here, three women share how the heart transplant team at Westchester Medical Center gave them a new chance at life. On February 5, 2015, Kelly Krzyzak was cutting out Valentine’s Day hearts with a coworker at Little Lambs nursery school when she began to feel uncomfortable and not like herself. She went home, where she experienced chest pains and vomiting before being taken by ambulance to a local hospital. She was stabilized there, then airlifted to Westchester Medical Center the following day. Krzyzak and her husband of 25 years, Donovan, are the parents of a 23-year-old daughter and an 18-year-old son. Kelly’s mother helped out with cooking and cleaning while she waited for her new heart. “I was very weak and, because of the stroke, couldn’t move my right arm,” says Krzyzak. Following a successful heart transplant on March 12, 2016, Krzyzak is back to full function. “I look at things differently. I definitely don’t sweat the small stuff,” she says. Then, in 2012, Gorcyznski began having serious breathing problems. “I could only get through half a dance with my husband; I’d have to sit down.” After about a year, her doctor sent her to Westchester Medical Center, hopeful she might receive a new heart valve, but her heart had deteriorated so much that Alan Gass, MD, FACC, Medical Director of Cardiac Transplantation and Mechanical Circulatory Support at Westchester Medical Center, placed her on the transplant list instead. She was hospitalized at Westchester Medical Center for seven months prior to receiving her new heart, on December 9, 2014. “The last couple of days, I didn’t think I was going to make it, but then they called me at 8:45 p.m. the night before and said they’d found a perfect match. 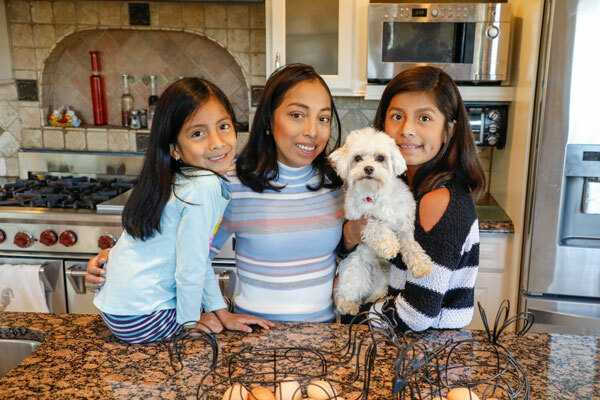 The first American-born child of Ecuadorian immigrants, Maria Quizhpi needed blood transfusions for the first several years of her life to treat a rare blood disorder, and had her spleen and gallbladder removed by age 5. Though the frequency of blood transfusions decreased over time, health issues remained a constant. “I’ve been sick all my life and was always lethargic,” she says. “But my immune system was getting stronger, and, when I was 19, I had my last blood transfusion.” She traveled to Japan, France, Italy and Spain and returned to the U.S. to work as a receptionist. Maria Quizhpi with her nieces at her home in Montrose. In April 2016, however, she experienced extreme shortness of breath and could barely stay upright at her job. Her mother insisted she go to Westchester Medical Center. “The walls of my heart had become so thin that my heart doubled in size. The doctors told us that getting an LVAD should help and that they would put me on the list for a heart transplant,” she recalls. Eight months later, Quizhpi got her new heart, with the help of cardiologist Chhaya Aggarwal, MD. “Now, I have more energy, and I can play with my nieces. When I had the LVAD, I wasn’t able to drive, so now just going to the store feels like freedom. I feel blessed, because a lot of people are still waiting for their heart,” she says. To learn more about the heart transplant program at Westchester Medical Center, call 914.493.7632. How can I keep fit through the winter?